Any personal information you choose to provide is protected by security practices. Non-personal information related to your visit to our website may be automatically collected and temporarily stored. You may elect to provide personal information (e.g. name, email address, phone numbers, mailing address, etc.) 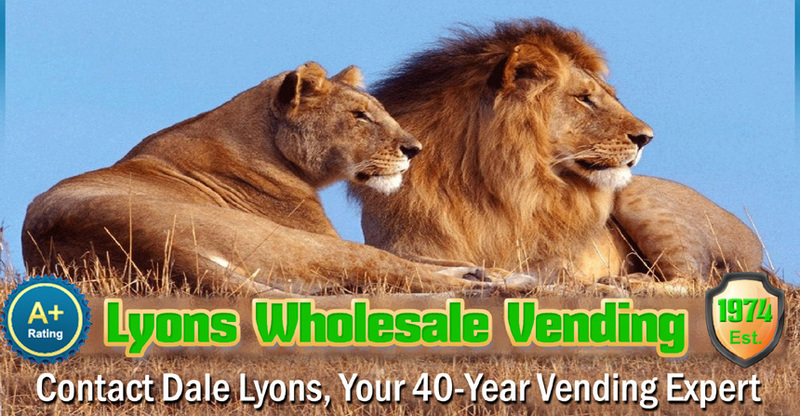 to LyonsWholesaleVending.com for request information, by completing a form to make a purchase, during a phone call when asked specific questions, or by sending us an email. We may use this information to send you product information or respond to your questions, but it is for internal use only. None of this personal information is necessary to access any information on our website. We maintain accounts on third-party websites, such as social media sites, as tools to better interact with the public. We have no control over the privacy policies of these sites and suggest you check their privacy policies to determine which ones you choose to participate with according to your privacy concerns. We currently use YouTube and Facebook, but plan to add others in the near future. Such technologies as “cookies” are used to optimize our website design by placing a tiny bit of code on your computer to record how you use our website. These are harmless to your system and are deleted from your computer depending on their purpose. Session cookies gather data for technical purposes such as improving website navigation and generating statistics about how our website is used. Session cookies expire when you leave our website, meaning they are deleted from your computer once your visit to our website ends. Multi-session cookies, or persistent cookies, customize our website for frequent visitors and to test variations of website design and content. Multi-session cookies are stored over more than one session on your computer. We do not use multi-session cookies to collect your personal data nor do we share data collected by multi-session cookies. Our multi-session cookies are set to expire after two years and are automatically deleted from your computer on the expiration date. LyonsWholesaleVending.com is unable to identify an individual through the use of these technologies.